It's difficult to run a productive and impartial meeting when you are one of the stakeholders. Professional meeting facilitators make sure that everyone has an opportunity to be heard, keep the group focused on the task(s) at hand, and adhere to agreed upon rules and schedules. How much do you know about group dynamics? 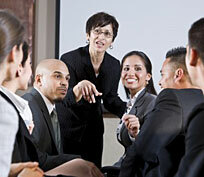 Can you really be impartial when facilitating a group within your own organization? Let the experts at the Center for Creative Management facilitate groups at your organization so you can be part of the solution.